The Tacoma Narrows Bridge Citizen Advisory Committee meeting scheduled for tonight has been canceled because not enough committee members were available to make a quorum. The meeting has not been rescheduled. It was the first of three public meetings to discuss what bridge tolls will be raised to in July. Submit comments or questions to the citizen advisory committee online at http://www.wsdot.wa.gov/Tolling/TNBTolling/CACfeedback.htm or by mail to TNB-CAC, 401 2nd Ave. South, Suite 300, Seattle, WA 98104-2862. Washington State Ferries spokeswoman Marta Coursey just sent out an e-mail that the rumors that the Steilacoom II was “sinking” stemmed from a photo posted on the Bitter End blog. The author has acknowledged that the photos he received were fake. The Steilacoom II is out of service because of a ship service diesel generator issue. It’s not known what caused it to fail, but parts have arrived from Portland and are being installed now. The damage is unrelated to sea conditions on Admiralty Inlet, Coursey said. A generator problem on the Port Townsend-Keystone ferry Steilacoom II will shut down the route until early Friday afternoon, Washington State Ferries spokeswoman Marta Coursey said at noon Thursday. The boat has been out since early Wednesday afternoon. Kitsap Transit came out Wednesday with how it plans to get along without the Manette Bridge, which will be closed all of next week between 9 a.m. and 3 p.m. They’ve got it figured out before the state has even announced — to us, anyway — that the bridge will be closed. I presume its for annual inspection. Routes 21, 25 and 29 will be detoured, and KT will run a Manette shuttle to serve riders who’ll lose service on the aforementioned routes. #21 Perry Avenue – The #21 bus will travel to and from the Bremerton Transportation Center using the Warren Avenue Bridge. It will serve Sheridan between Wheaton and Schley, Schley between Sheridan and Magnuson, Magnuson to Perry Avenue and Perry from Stone Way to Sylvan. The portion of the trip between Perry and Sylvan and the East Bremerton Transfer Center will operate normally. #25 East Park – The #25 bus will travel to and from the Bremerton Transportation Center using the Warren Avenue Bridge. It will serve the Harrison Hospital loop then serve the north portion of Lebo, Rickey, Pine and Sheridan as it normally does. #29 Trenton Avenue – The #29 bus will travel to and from the Bremerton Transportation Center using the Warren Avenue Bridge. It will serve Sheridan between Wheaton and Perry, Perry between Sheridan and Stone Way, and Stone Way between Perry and Trenton. The portion of the trip north of Trenton and Stone Way and the East Bremerton Transfer Center will operate normally. Manette Closure Shuttle – The Manette Closure Shuttle bus will serve Shore Drive, 11th, the south end of Trenton Avenue and Perry Avenue, Old Wheaton Way and Harrison Hospital, taking riders to the East Bremerton Transfer Center. It will meet the eastside buses at the transfer center, then operate as a take-home back to the Manette area. There will be no ferry service between Port Townsend and Whidbey Island until at least Thursday. The Steilacoom II had generator problems that forced it to cancel sailings, beginning with the 2:15 p.m. departure from Port Townsend. A crew from the Eagle Harbor maintenance facility is on site and will work into the night to make repairs, said Washington State Ferries spokeswoman Linda Lacombe. It might be into Thursday morning before it can be fixed. The operations center will send out an update before midnight so people will know what to expect in the morning, she said. The state is leasing the Steilacoom II from Pierce County until an under-construction ferry can take over next summer. 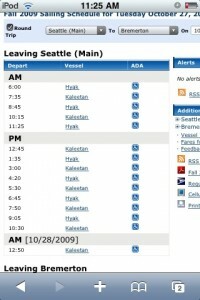 The iPhone, Ferry Schedules and You. Naturally, my jaw goes slack and the hamster upstairs starts running a little faster. Oh, and I pull out my iPod Touch. The rest of this post is also for you iPhone owners. Those crumpled ferry schedules in your pockets are SO 2004. Now, when you need to find out when the next boat leaves, you reach for your smartphone. This doesn’t really apply to you hardened ferry commuters who can recite the schedule for your usual run backwards, frontwards, divided by three and in Swahili. But for occasional rider, or those of us who sometimes use other routes (I take Edmonds/Kingston to get to my Dad’s house, but use the Bremerton/Seattle ferry 90 percent of the time.) having access to schedules on your iPhone/iPod Touch are mighty handy. Right now, there’s a $5 app, an app in development that says it’ll be free, and my slightly more homebrew solution that’s gloriously free. 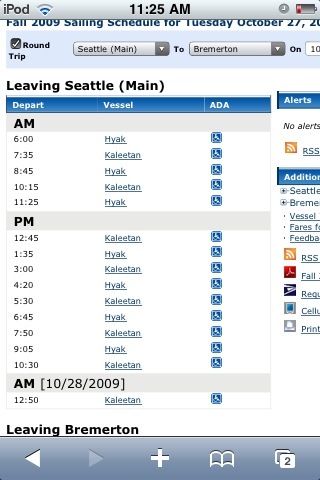 Ferry times and service alerts for all the runs. A map of the routes. Access to the state’s terminal Web cams. The ability to search schedules for different dates. My thoughts: I own this app, actually. It has a load of features (some of which require internet access that I don’t always have on my iPod, but what iPhone users would.) and is essentially a repackaged version of the Washington State Ferries’ Web site. You can access the full schedules without an internet connection. iFerry, a effort by a Bainbridge company that is “coming soon” to the app store, according to its Web site. It looks like it’ll have much the same functionality of the previous app, with a few nice additional touches. And it says it’ll be free. 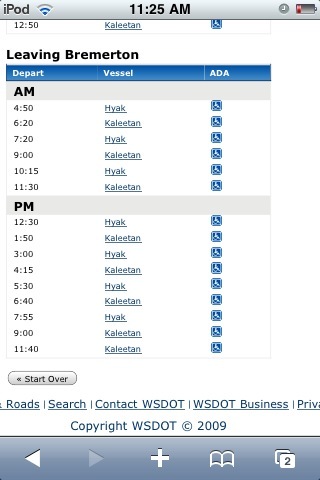 Current schedules for all the routes. Updated wait times for ferries. My thoughts: Looks neat. Hope it stays free. Gonna put a dent in the other app’s sales if it is free. It will have ads. But the other app does, too. Keep an eye on both apps to see what happens when they compete. Will they both be free? Will they both decide to charge? Will they not have any real impact on the other? If you just CAN’T wait until the new app, and don’t want to spend money on the first one, have I got a slightly convoluted, but free solution for you. I’ll give you a couple, actually. First, for those of us with iPod Touches who don’t want to pay $8 (YIKES) for WSF’s Boingo wifi, you can simply head to the WSF site at home, and pull up the schedule or schedules to your most-used routes. On your iPod (Or iPhone) align the schedule so it fills the screen nicely, and hit the round button, and top on/off button at the same time. I’ll make a screen grab from your device, and save it in your Photos thingamajig. Every time you need to scan the schedule, just pull up the photo. Our Kitsap schedules stay pretty much the same. Naturally you won’t get automatic ferry updates, terminal cameras and other gee whiz geegaws, but it’s f-r-e-e. And you don’t have to worry about losing that paper schedule you crumpled in your pocket. For those of you fancy pants people with iPhones, here’s a free workaround to get the two most important features: The schedule and service alerts. First, you could just bookmark the schedule page. Or, you could add that page as an icon on your home page. Just pull up the schedule in your browser, click the + button, and select “Add to Home Screen”. Icon created! Magic! You want route alerts, do you? Well, you’ve got internets in your pocket, so head to the state’s Web site here, and sign up for ferry alerts to your routes of choice. Every time a service alert is sent, you’ll get an e-mail. There you have my thoughts on ferry planning for iPod Touch/iPhone owners. Those of you with Blackberries, Android or WinMo phones, share your tips in the comments, eh? And for those of you Luddites who still use paper schedules? Well, there’s nothing wrong with that, actually. And that, too, is gloriously free. Keurig will serve free, freshly brewed gourmet coffee to commuters this week at the Bainbridge and Bremerton ferry terminals. The Tully’s coffee will be available at a Keurig booth from 6 a.m. to 10:30 a.m. and 2:45 p.m. to 7 p.m. Thursday and Friday at the Bremerton terminal and from 6 a.m. to 11:45 a.m. and 3:30 p.m. to 7 p.m. Oct. 28, 29 and 30 at the Bainbridge terminal. Commuters can get coffee in their choice of flavor and brewer discounts for future use. Keurig will also donate $10,000 to Food Lifeline. Covering the opening of Burley-Olalla Road the other day got me to thinking how far Highway 16 has come since I grew up near there in the 1960s and ‘70s. What a difference fortysome years makes. Back then it could be a bloody mess. One lane in each direction. No median. Uncontrolled intersections every couple miles. Crazy people trying to pass on corners, after dark, in the rain. Like Highway 3 is now between Gorst and Belfair, only worse. The most dangerous intersections don’t exist anymore. They were at Bethel-Burley Road, which we called Nelson’s Corner because of Mr. Nelson’s service station there, and Sidney Avenue. Those were nasty places. If you wanted to get onto the highway, you’d have to wait for a break in the 60 mph traffic, dart in and then get up to speed before being rear-ended. Fortunately, the towing company and the fire station were right up the street from Nelson’s Corner, and they kept pretty busy. I wish I had the accident stats to compare how much better things are now that there’s a divided highway with no more side roads crossing it. Burley-Olalla was the last one. I can’t remember when it went to four lanes with a median. I’m guessing in the late 1970s when I was out of town. That would’ve been about the time the feds were spraying money all over as part of building the Trident submarine base. If not for Trident, we’d still be back in the 1970s in terms of roads and schools. All three of my schools were bulldozed and rebuilt. Nowadays, you really have to try if you want crash on Highway 16. The wheels fall off, you have a heart attack, or you’re a total idiot. I’ve been commuting through there forever and only been in one accident. It had snowed a lot and there was slush all over the road. A flatbed truck blasted past in the fast lane and slopped me down. By the time I could see again, I was spinning. Looked straight at the cars coming up behind me. Fortunately, I kept spinning around and wedged into a snow bank on the shoulder. The new Burley-Olalla interchange should prevent the ghastly wreck I saw several years ago. I was driving to work in the pre-dawn blackness. I’d never seen fog so thick. As I neared Burley-Olalla, it looked like a bomb had gone off. Flares and flashing lights were swallowed by hovering smoke and fog. Flames rose from two shadowy hulks. It was like Halloween. A driver entering the highway from Bethel-Burley had turned left too early, got going the wrong direction and was hit head-on. Neither one knew what hit them. Today I can barely make it 23 miles to work without taking a nap, but 35 years ago when I was working in Las Vegas I’d drive all the way home without sleeping. I’d be so excited to see my people and, making $377.50 a month, couldn’t afford a hotel. I made it all the way to Mullenix Road once, only a couple miles to go, when I conked out. When I woke up, I was on the oncoming shoulder and about to go over the bank. Fortunately, it was 2 in the morning and nobody was on the road. I just cranked it back into my lane and rode the adrenalin the rest of the way home. My dad remembers when there was no highway there at all. Bethel-Burley Road was part of the “old highway” that wound from town to town. That would’ve been until the 1950s. But when I was a kid, we walked the sandy trail above the east side of the highway to the gas station for a pop or some candy at Hi-Way Market, both of which are still there. That was probably a 5-mile round trip, pretty gutsy for little 10-year-olds. Back then, it was standard practice to toss stuff out your car windows, so we’d go pick put all the bottles and turn them in for cash. It was like a penny for a beer bottle, a nickel for a regular pop bottle and a dime for a quart bottle. Oh to be a kid again, except with a divided highway. Washington State Ferries released its ridership numbers for August and September. There were service disruptions in September that affected the Bremerton, Kingston and Bainbridge routes. As part of the Hawaii Visitors and Convention Bureau advertising campaign, Hawaiian music will play at Colman Dock on Monday from 4 p.m. to 7 p.m.
Hawaii would look pretty good right now. And don’t forget. There will be live music on the Bainbridge-Seattle route every Saturday. This week it’ll be Greg Spence Wolf.